Now is a golden age for the pink drink in Washington. 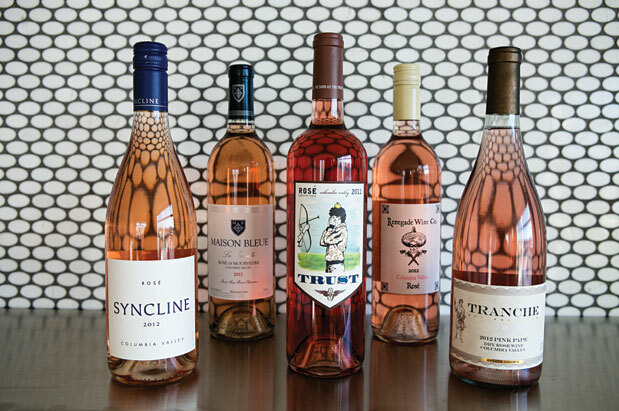 Rosé has been undergoing a metamorphosis in Washington, from afterthought to intention. The old way of thinking went something like this: “Hey, we’re bleeding a bunch of juice out of these fermenters to make our big red wines. Instead of sending that juice down the drain, why don’t we ferment it, bottle it and sell it? Instant cash flow!” The results: sometimes sugary, often boozy, always forgettable. No more. Today’s rosé is a more grown-up, deliberate drink, and consumers are taking notice. As a result, securing the best versions requires a bit of advance planning. Several of the finest pinks are mayflies, blinking out of existence almost immediately after entering the world, selling out well before Labor Day. Part of the poignancy of rosés is their ephemeral nature. They’re here, they’re lovely, and then—all too quickly—they’re gone. Most are just being released, so right now, today, is the perfect time to stock up on our state’s most delicious rosés. With rainy days still with us, it can be hard to make the leap of the imagination to stock up early. Take a moment to imagine a sky uncluttered by clouds, the full sun warming your flip-flop-shod feet, sweet smoke wafting off the barbecue and the chill refreshment of a pale pink wine. Here are a few tricks for cutting through the rosé-colored clutter: First, the best versions come from grapes specifically harvested for rosé (as opposed to the saignée method described above). Typically, they’re picked a few weeks earlier than the red-grape harvest, which keeps the acids high and the grape sugars low. Low grape sugars equate to low alcohol, so you can usually find these bottles by eyeballing the alcohol percentage on the label and grabbing bottles at 13.5 percent or lower. Second, thinner-skinned varieties generally work best. Versions made from thicker-skinned grapes (Syrah or—gulp—Cabernet Sauvignon) tend to make richer, flabbier, fuller-bodied wines that simply don’t suit a midsummer day. Look instead for Grenache-, Cinsault- or Cabernet Franc–based rosés. And finally, don’t worry about overstocking. If a few bottles happen to survive the summer, rosé is a perfect drink down the road (even versatile and vibrant enough for the Thanksgiving table) and, of course, it’s good with breakfast all year long. 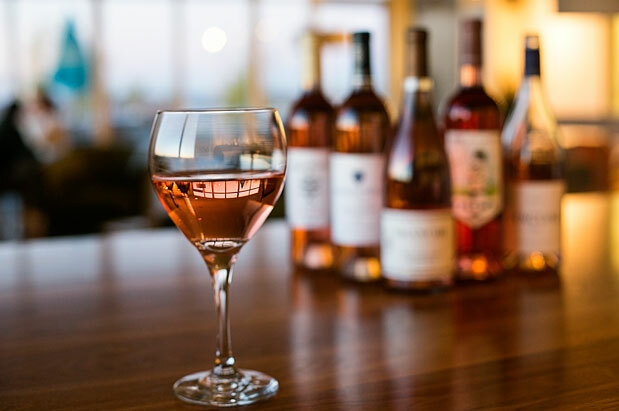 Syncline, the flagship winery in the Columbia Gorge AVA, was among the early Washington wineries endeavoring to produce a serious rosé, and is now a standard-bearer for the state. Its release each April augurs the summer to come. The 2012 release, a blend of 49 percent Mourvèdre, 39 percent Cinsault and 12 percent Grenache, presents a summery core of strawberry and watermelon. While the acid is abundant, this also has an attractive creaminess, as well as subtleties of straw and spice to ratchet up the complexity. PAIRS WITH: Chicken roasted with salt, pepper and butter. A spicy, grapey, garigue-dusted nose introduces this Mourvèdre-dominant homage to Bandol from Jon Meuret of rising-star Yakima Valley producer Maison Bleue. While there is some richness to the texture here, it is unmistakably grown-up rosé, glorying in its zingy acidity and mineral austerity. PAIRS WITH: Dry-rubbed, grilled pork ribs. Steve Brooks of Walla Walla’s Trust Cellars has been making this 100 percent Cabernet Franc rosé for years. Franc is a great choice for rosé, as it always seems to add savory complexity, here in the form of a light straw/hay note overlaying the core of fruit. That fruit is a lovely, brisk mix of kiwi, pineapple and apricot. There is fine intensity and surprising nuance here. PAIRS WITH: Grilled flatbread with eggplant, zucchini and tomato. A side label from Trey Busch of Sleight of Hand Cellars, the Renegade blend includes Mourvèdre, Cinsault and Syrah. Summery aromatics combine watermelon flesh and watermelon rind. The palate is a fruit salad, with notes of honeydew, watermelon and banana. There is a eucalyptus top note that keeps things fresh, plenty of energy and briskness in its drinking. Add one hot deck and one cold fridge for a small summer ecstasy. PAIRS WITH: Fresh caprese salad. Quickly becoming one of the hardest-to-source Washington rosés, this is a ringer for some of the finest pink drinks coming out of the southern Rhône Valley. It’s a blend of Cinsault, Counoise and Grenache, all from Blackrock Estate Vineyard in the Yakima Valley. Pink melon, pineapple and stony minerals combine on a spritzy, acid-driven frame. Its vibrancy is its charm. PAIRS WITH: Shioyaki-style (salt-grilled) salmon.